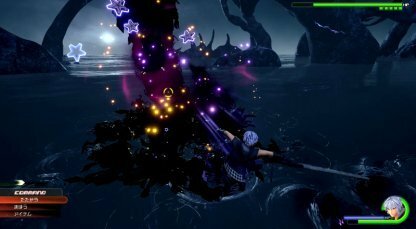 Check out this Kingdom Hearts 3 (KH3) story guide and world walkthrough of Keyblade Graveyard! Including map locations, boss fight tips, gameplay tricks, & more! The Demon Tower you face in this part is essentially the same one you fought in Olympus. This time, you'll be fighting as Riku. It has the same moves and a cutscene will trigger when its HP gauge is reduced to 1 bar. 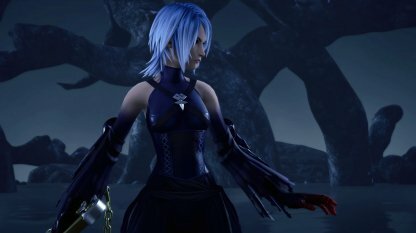 Anti-Aqua has the same moves as Aqua has. 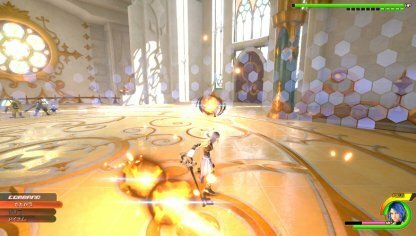 She does strikes with her Keyblade and also spins around, creating a Blizzard with her clones. She separates into body doubles so lock onto the real one in order to not lose track of her. You will be able to change into the Rage Form when fighting against the Anti-Aqua. The Rage Form unique move, "Risk Charge" can give a tremendous boost to your damage with the cost of your HP.Keep in mind you cannot heal while in Rage Form. Be careful not to spam this move. 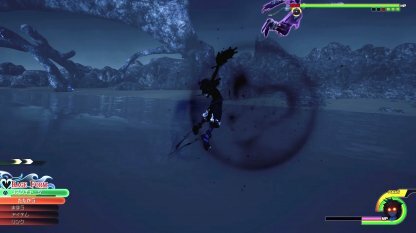 Vanitas uses a lot of fire-based attacks in this fight. His attacks are not that varied but he has a lot of HP. Keep calm, dodge his attacks, and wait for an opening to strike him. Slowly but surely, you'll bring him down. 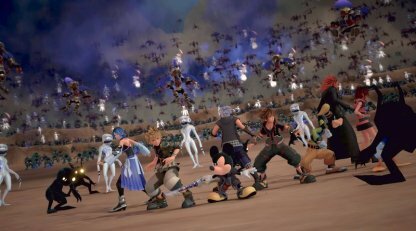 Once you land at the Keyblade Graveyard, you'll automatically face off with a numerous horde of Heartless. It's best to utilize your collaborative attacks, magic, links, and Attraction Flow to bring their numbers down. When you've reunited with everyone in the Keyblade Graveyard, Sora will be torn apart and you need to go into the mirror world to collect all 111 of his fragments. Your mission here is to collect 111 fragments of Sora, however the actual number of Sora fragments will spawn more than that. Try prioritizing areas with multiple Soras to shorten the process. Lich's main method of attack are their magics. If you look carefully, you will see that their attack patterns are numbered, and will be easy to dodge once you get the patterns down. If you are not confident in your dodging skills, try equipping items to boost your Fire, Blizzard, and Aero resistance. When you deal damage to the Lich, they sometime split into an exploding clone, inflicting damage to those who touch. Although the Lich has low HP, charging in too recklessly might cost you your life. During this stage of the game, you'll be hunting after Liches that have stolen the hearts of your friends. Equip the ability "Glide" so you can maneuver faster into the air when you chase the Liches down! When you've damaged the Lich enough, you'll notice that it will summon more enemies around you. This makes it hard to focus on the Lich. Keep locked onto it and jump frequently to avoid getting attacked. In the 3rd battle against another Lich, the summoned Heartless will be different again. If you're not confident enough in your skills, it's best to defeat the summoned Heartless first before attacking the Lich. Lich has a powerful Firaga -> Bllizzaga -> Aeroga magic combo. 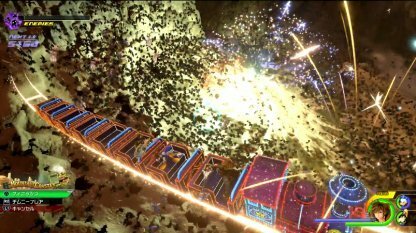 The Blizzaga especially has a 100% chance of inflicting freeze, and will give the enemy a free hit with the Aeroga. 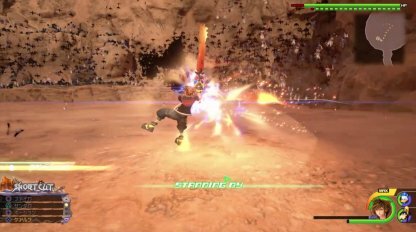 By using the Crystal Snow Keyblade, you will be able to mitigate this combo, and your overall damage taken. During the battle, the Demon Wave will commence deadly tornado attacks and tries to engulf you in it. If you see this move coming, prioritize avoiding this attack at all costs, as this move is unblockable and will multi hit; potentially killing you in a single blow. 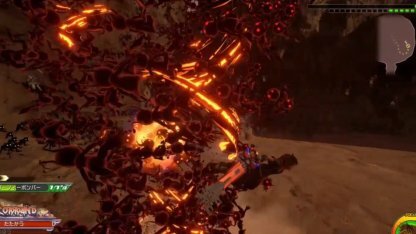 Using ranged magic attacks such as Firega will be a viable tactic to deal damage to the Demon Wave while keeping a safe distance. Try using Firaga to chip away at their health if you are not confident you can keep a safe attack distance. 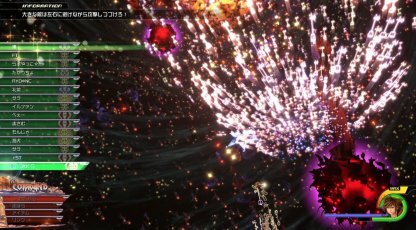 After defeating the Demon Wave, you will continue to confront the giant horde of Heartless. 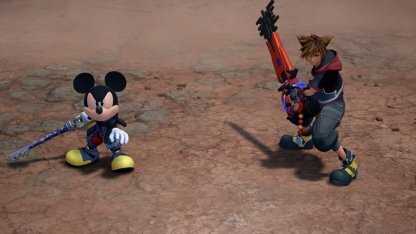 Sora will be assisted with the countless number of Keyblades, and will be able to hold his ground by repeatedly attacking for the early part of the battle. 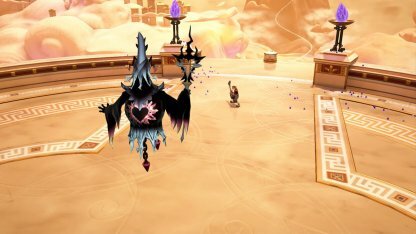 From mid-battle phase, the Heartless will start throwing projectiles at you. Dodge left to right while continuing your attack and deliver the final blow in the end. 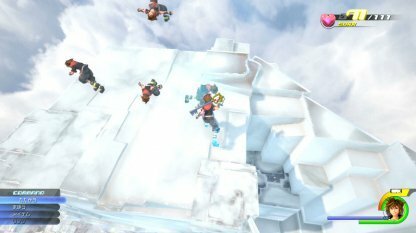 In these battles, you will need to confront 3 Organization XIII members simultaneously. Even with assistance, it will prove difficult to keep track of all 3 enemies. Try to focus fire and finish off one member at a time. 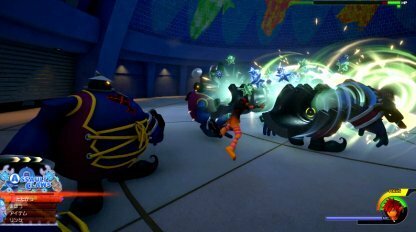 Your allies such as Mickey and Aqua will try to hold back the enemies that you are currently not battling. However, should they be KOed, that enemy will try to regroup and gang up on Sora. Try to keep you allies up with Cure as long as you can to avoid being out numbered. 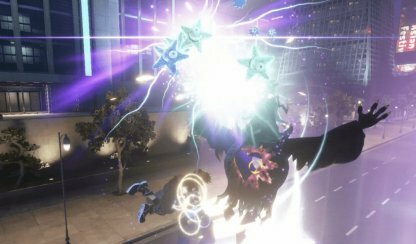 In the final battles against the members of Organization XIII, it's recommended to equip the ability "Glide". This will help you maneuver yourself into the air, dodging on-ground attacks, and reach enemies to hit them fast. In the labyrinth, stepping on colored tiles on the floors opens & closes corresponding doors. 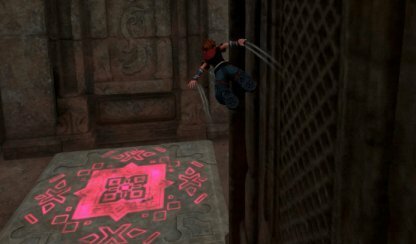 Equip glide so you can avoid stepping on doors and be able to roam the labyrinth freely. 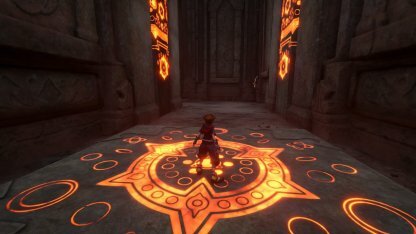 Before you can reach Aqua or Axel to help them out, you need to pass through the labyrinth. To open doors, you need to step on certain floor switches. If there are certain switches you don't want to step on, just glide over them. 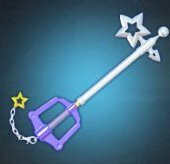 When you clear the KeyBlade Graveyard, you will be able to go to Eclipse at Gummiship. When you defeat the boss' s Omega Machina, you can get Orichalcum.